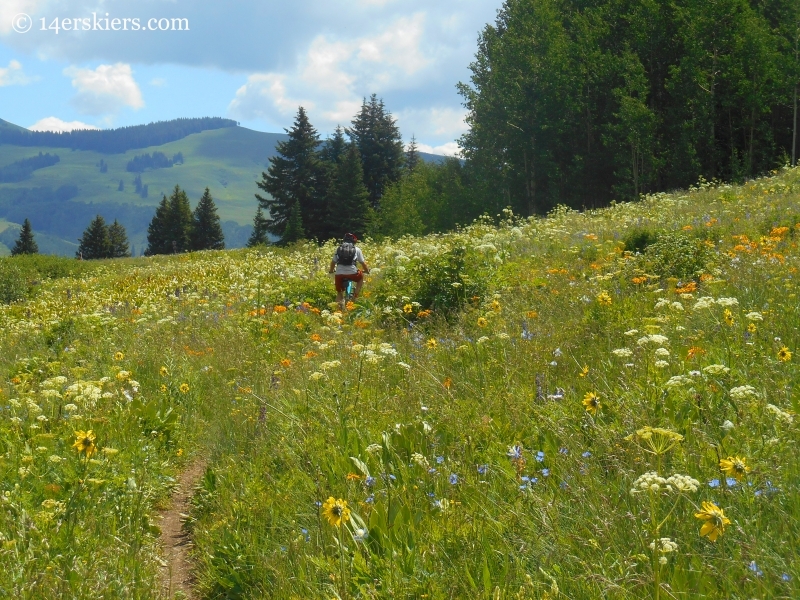 Admittedly, Crested Butte Mountain Resort is one of my favorite places to ride my bike. 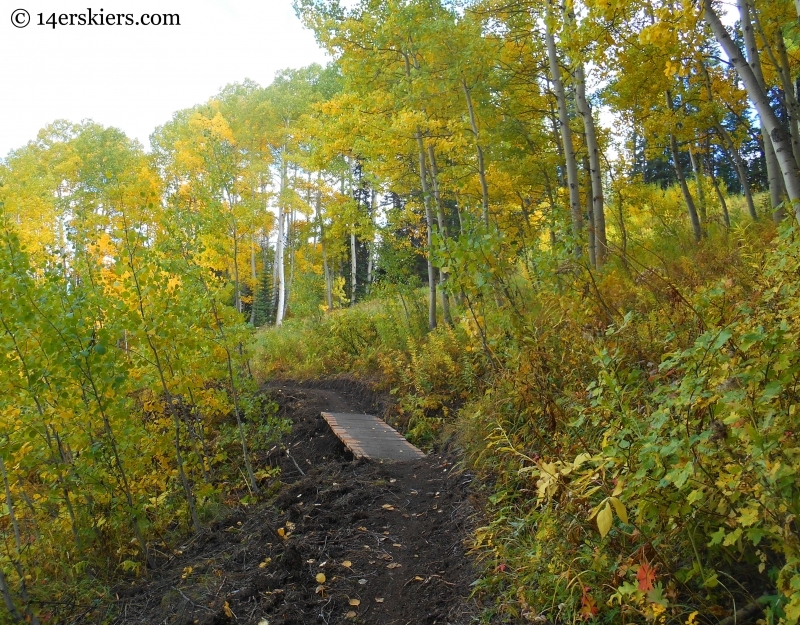 CBMR has done a lot of work lately to create a system of trails that appeals to all users. And, frankly, we think they’ve done a great job. 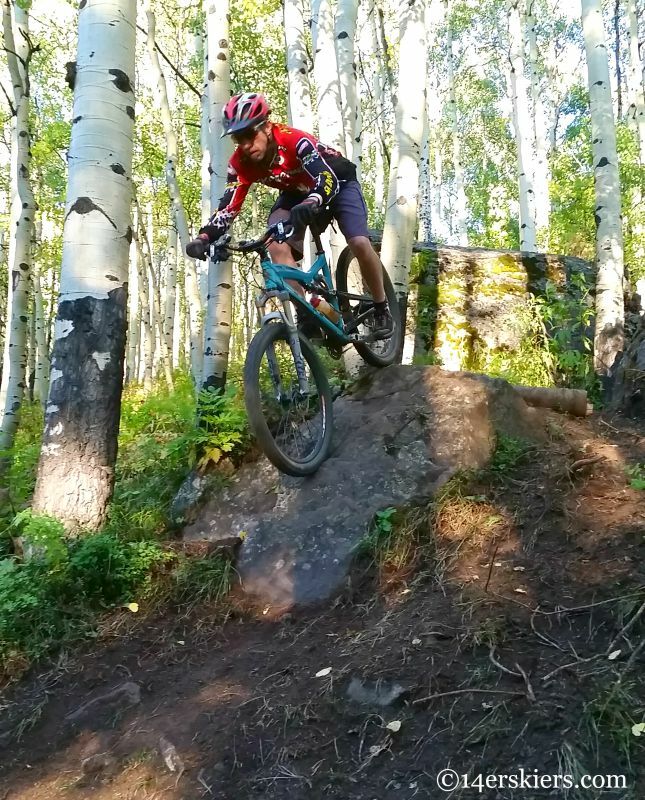 Whether you’re looking for some cross-country style mountain bike rides to crushing the techy downhills, from beginner to expert, looking for a short ride or long, CBMR has the trails for you. 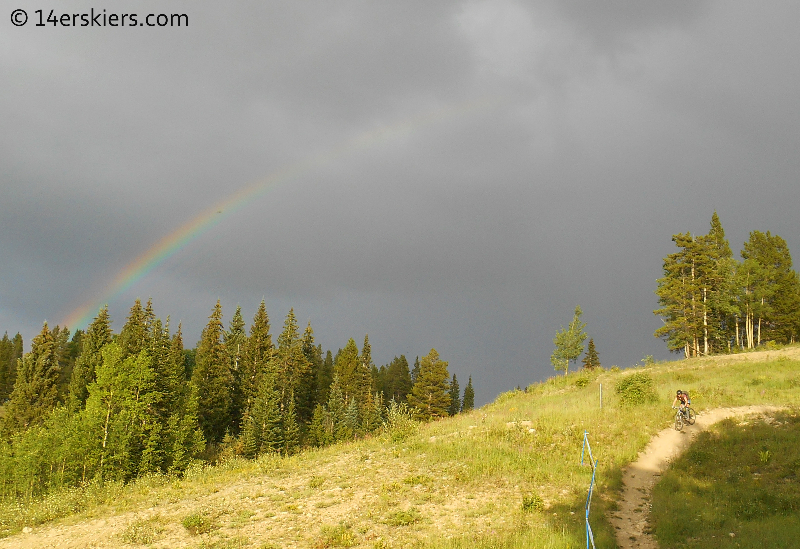 But, descriptions of the trails at CBMR are sparse and the amount of trails can sometimes seem overwhelming. 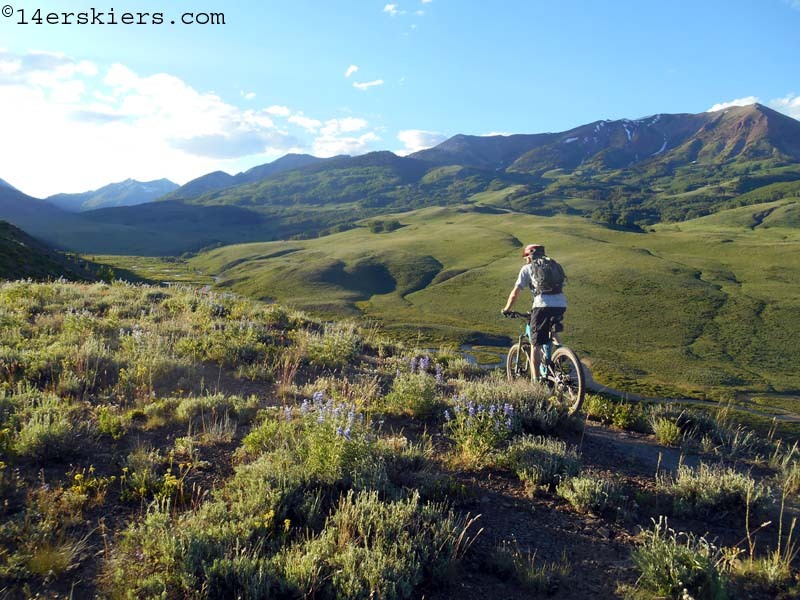 So, welcome to the Crested Butte Mountain Resort Biking Guide. 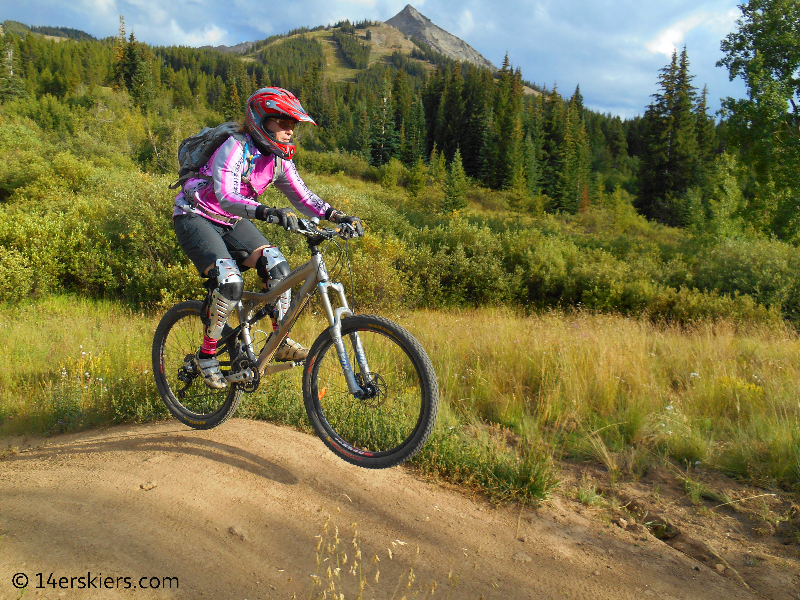 This is the guide that will tell you what you need to know about riding in Crested Butte Mountain Resort. 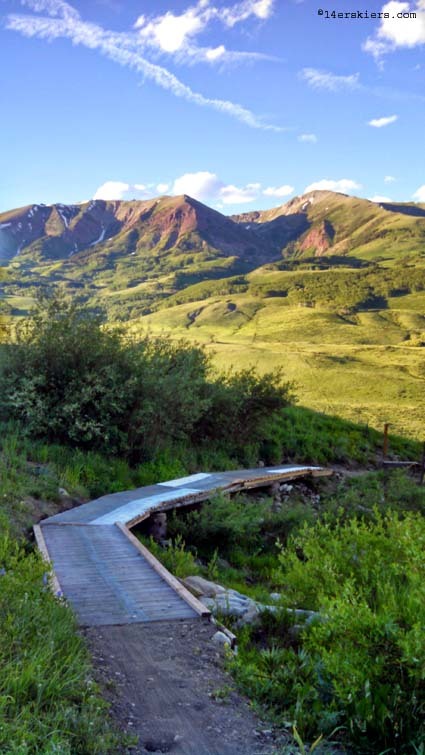 The trails at Crested Butte Mountain Resort are open when there isn’t snow on them, or they’re not trying to make snow (in the fall), during daylight hours. 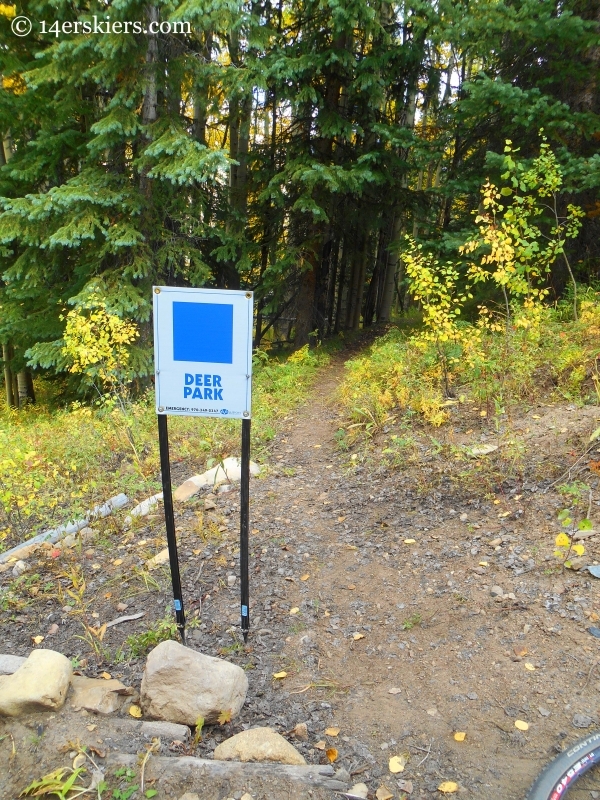 This means, despite what the lift hours might be, you can still ride the trails at CMBR. 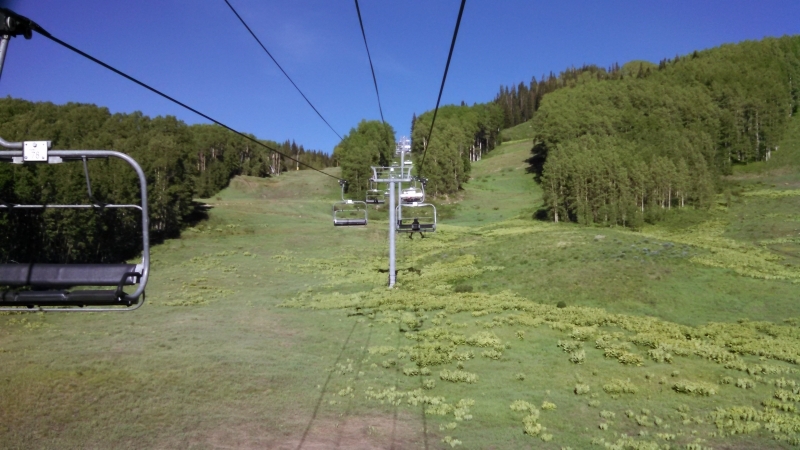 Riding the lifts provides for a great downhill riding experience. But, you don’t have to ride the lifts. In other words, you are not required to buy a lift ticket, nor do you have to pay to use the trails at CMBR, unless you want to ride the lift. Trail Map – Plot your route and know how the trails interconnect! Tickets and Passes – You don’t HAVE to ride the lift. But, here’s the info if you want to! The lifts can be useful to access riding in a different way. Though I frequently ride CBMR’s trails without accessing the lifts, I definitely enjoy the times when I do use the lifts to maximize the downhill riding available. 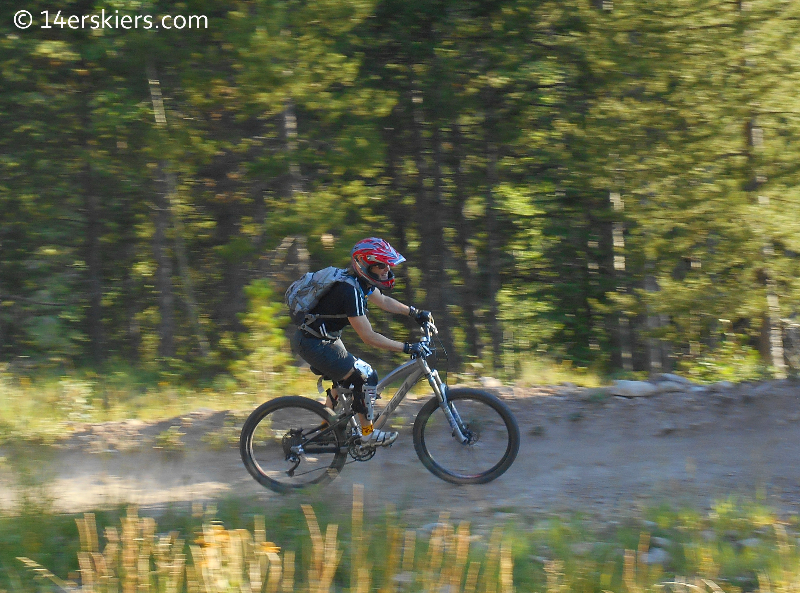 Free Friday Night Twilight Lift rides are one of my favorite things about biking at CBMR. 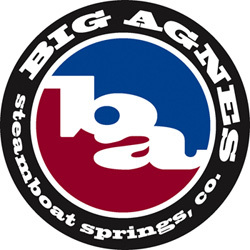 Beginning on Friday June 20, 2014 and every Friday for the rest of the season, lift hours on the Red Lady Express are extended in to the evening and lift tickets are free – after 4:30 pm that is. The free riding extends until 7:00 pm. So, take advantage of these extended lift hours! See how much fun it can be! 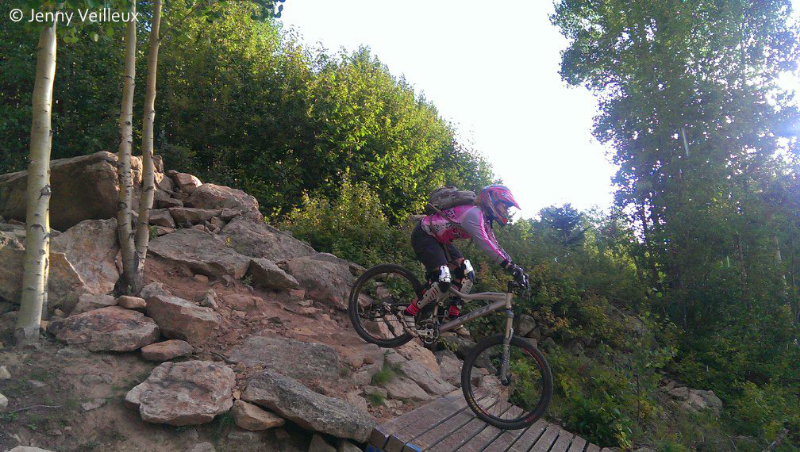 At CBMR there are different types of trail use. By designating trails for specific use, it helps increase rider experience as well as the safety of hikers and bikers alike. 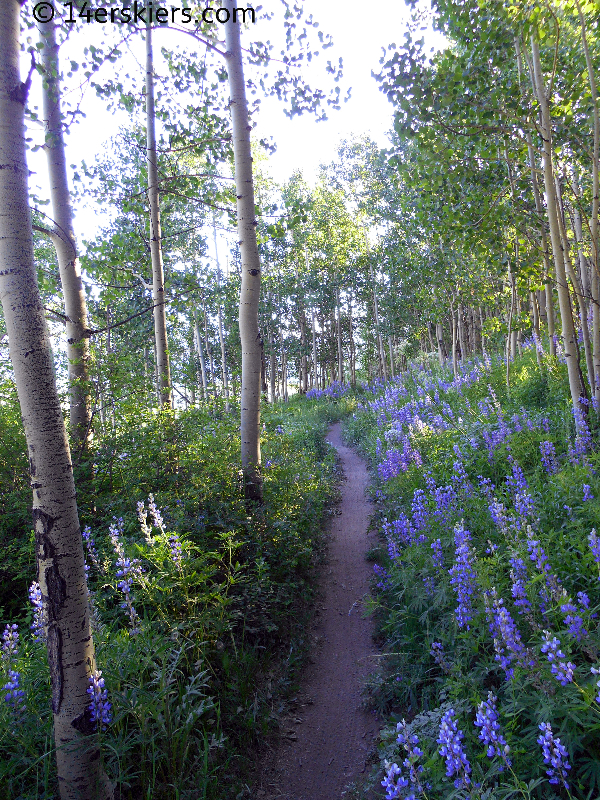 It is especially important to pay attention to trails that are designated as downhill only. Hikers are not allowed on these trails. A trail that is designated as two-way traffic allows both uphill and downhill travel. 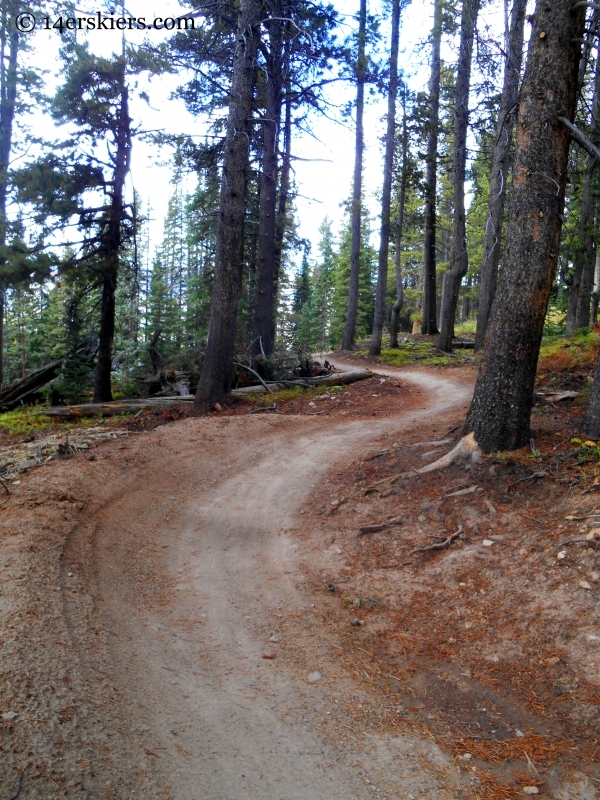 A multi-use trail allows both hiking and biking. 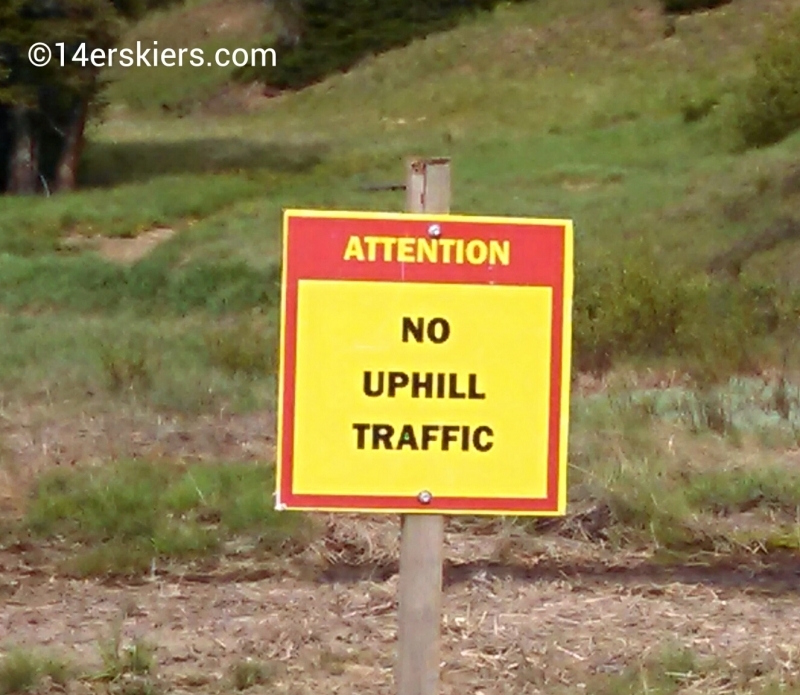 However, downhill riders on multi-use trails must always yield to uphill traffic. Description: This trail is one level more technical than Timeline, even though both are rated “advanced”. 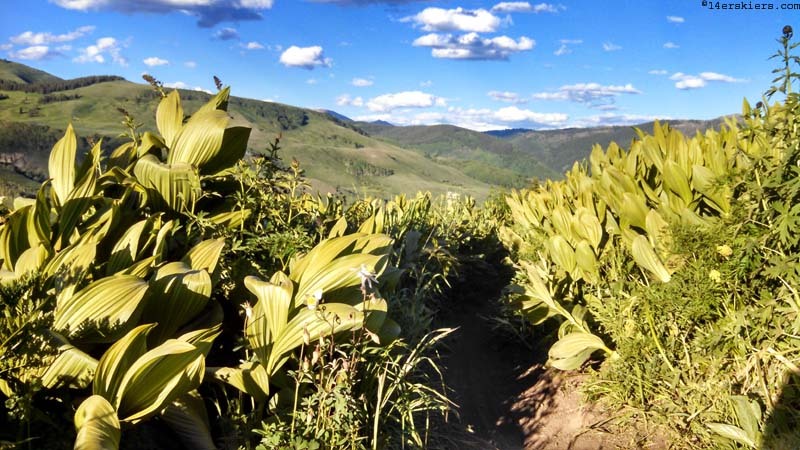 With some nice rooty and rocky sections, this trail provides some challenges for even those accustomed to downhill riding. It’s a fun ride, but probably worth scoping out some of the sections before diving in. Description: You don’t need to be a beginner to enjoy this trail. 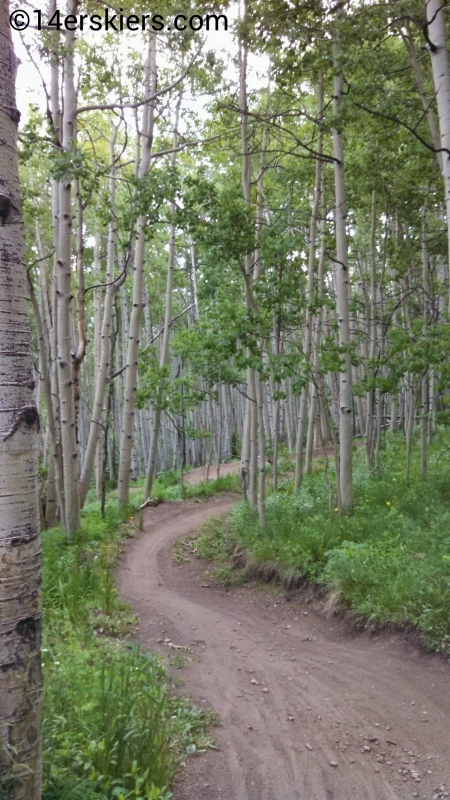 Fast and flowy, this trail winds through a beautiful aspen forest, with nice smooth banked turns. 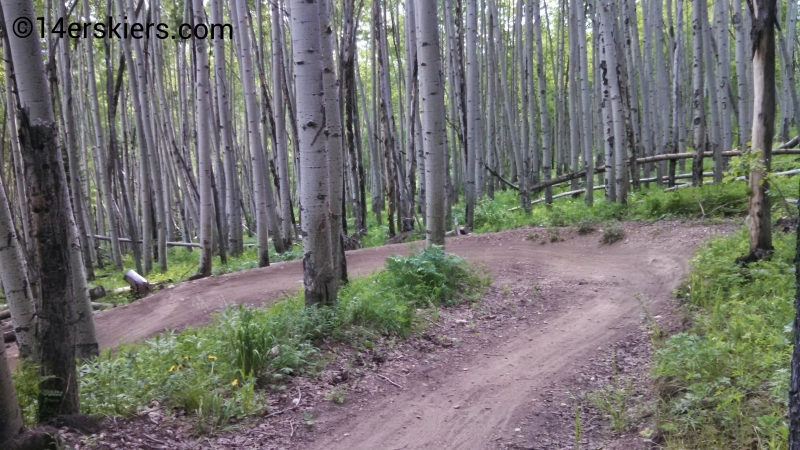 Good for downhill riding and xc-riding this trail is one of CBMR’s best. 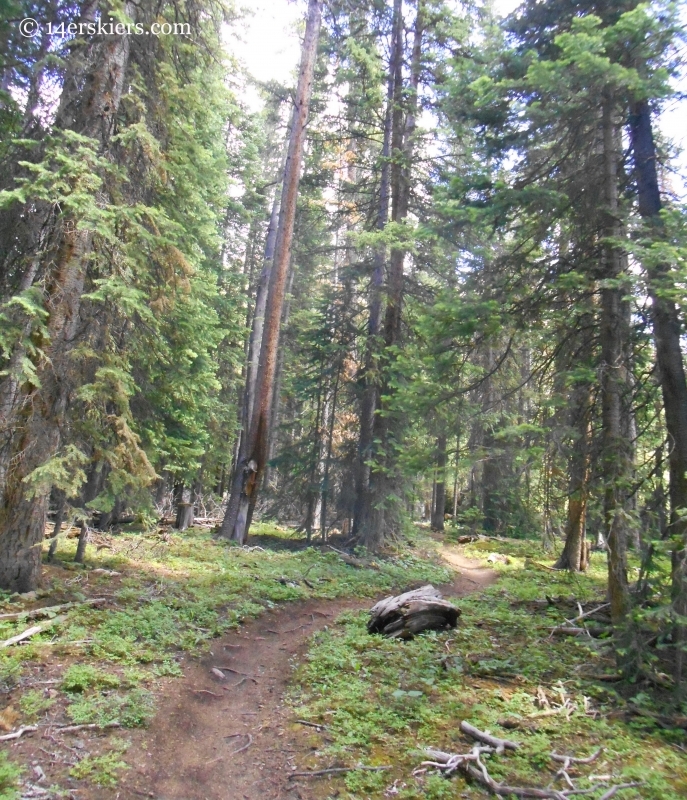 Description: This trail is a bit tucked away and can really only be accessed via the lower part of Avery. On the 2015 map, it was listed as a single black. But, in all honesty, it doesn’t compare to any of the single blacks on the rest of the mountain. This really should be labelled as a double black. It’s a short, steep, very technical trail that passes through several boulder sections. Boulder Mason is fun, makes a great addition to the trail system, and is a perfect warm-up for the more difficult Psycho Rocks. 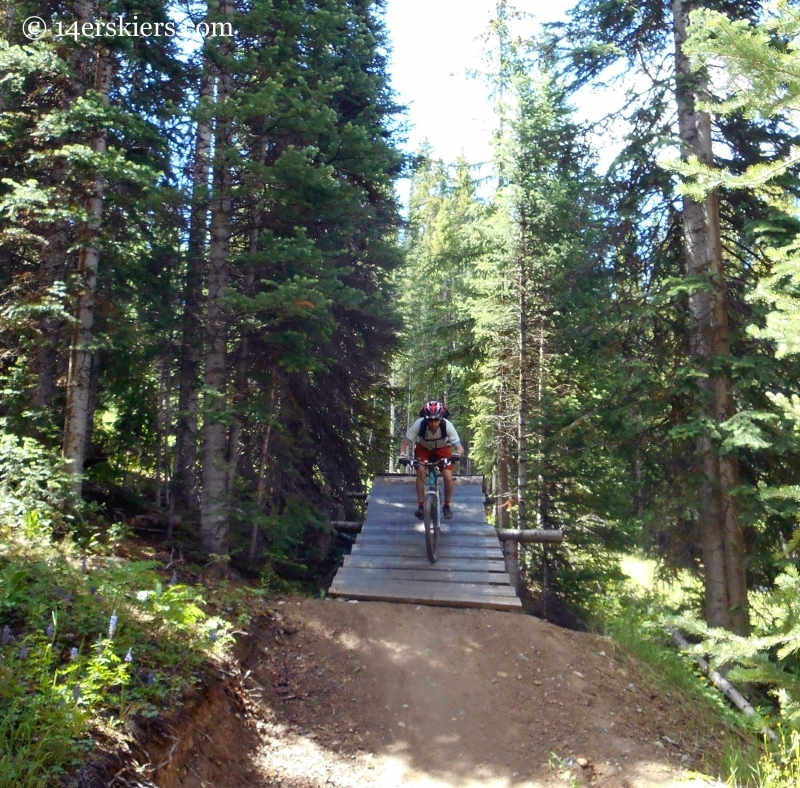 Description: Captain Jack’s is an exciting downhill course that begins with a fun bridge crossing over the Westside Trail. It then continues on through the forest to a very steep and technical pitch. But, it’s not done after that! Cap’n Jack’s winds through tight rooty trees with some faster sections interspersed. 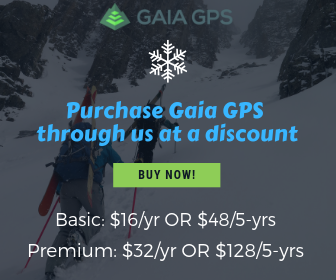 It’s a great trail and one of the area’s most challenging. With it’s start being a little further from the top of the Red Lady lift, this trail can sometimes be overlooked. But, this is one that should not be forgotten! 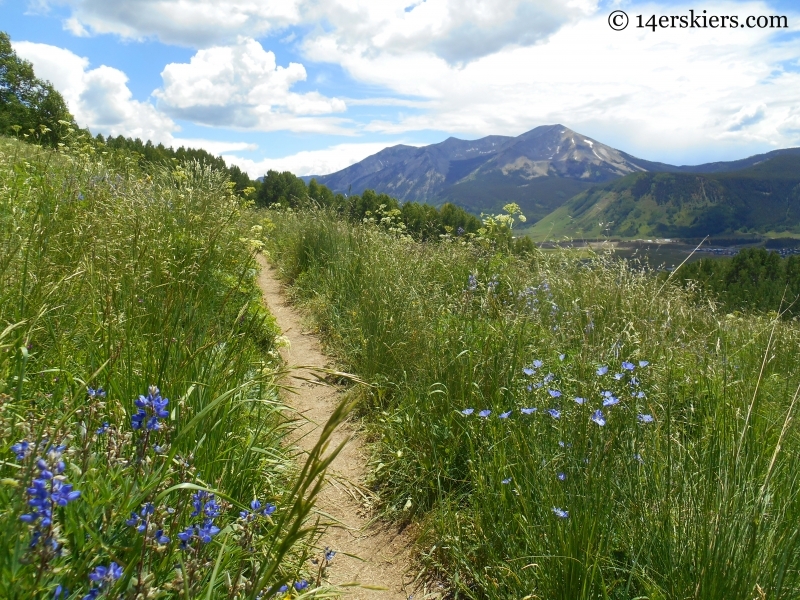 Description: Columbine is one of CBMR’s most scenic trails. 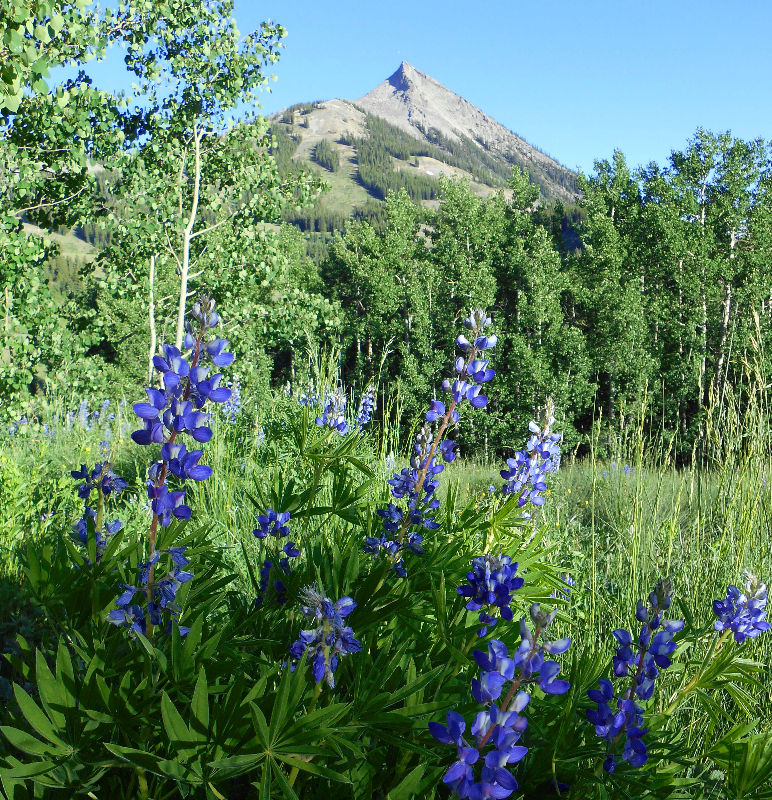 It meanders through meadows and aspen forests, and provides excellent views to the south and west. 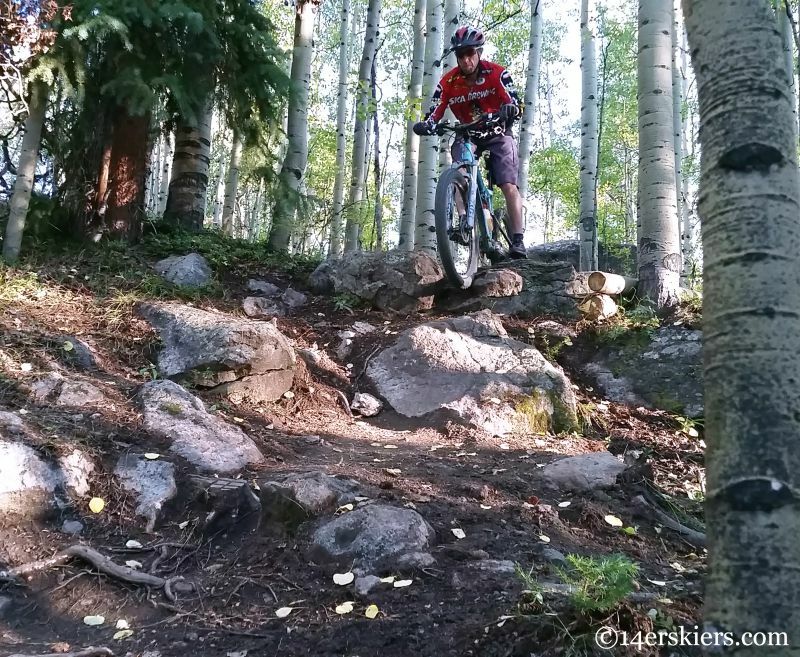 While it is possible to ride Columbine downhill, this trail can lack flow while going downhill as it sometimes interrupted by unwarranted uphills. I personally think this trail is much better ridden uphill and is one of my favorite ways to access other downhill trails on the mountain. Description: Crusader is near Wood’s Trail, and is similar to Wood’s trail, but even more challenging, despite them having that same “Advanced” rating. 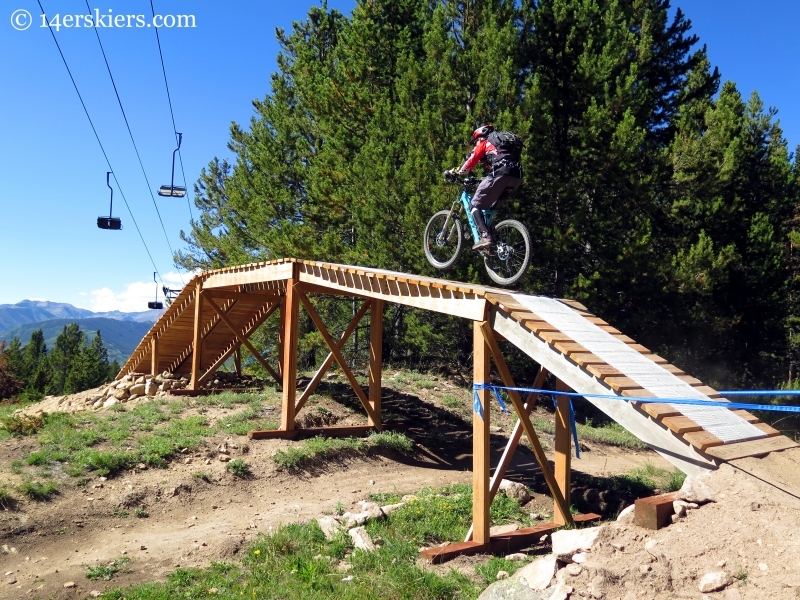 Crusader is a flying freeride trail, full of jumps and wooden features – some of the most difficult ones we have at CBMR. Don’t worry, the hardest ones are optional 😉 It’s a cool trail, and worth scouting before really riding it all the way through. In order to return to the base, riders must descend Propector Road, taking a left onto Gothic Road, riding on the road back to the ski area. Description: Deer Park is a worthy addition to the backside of the ski area. 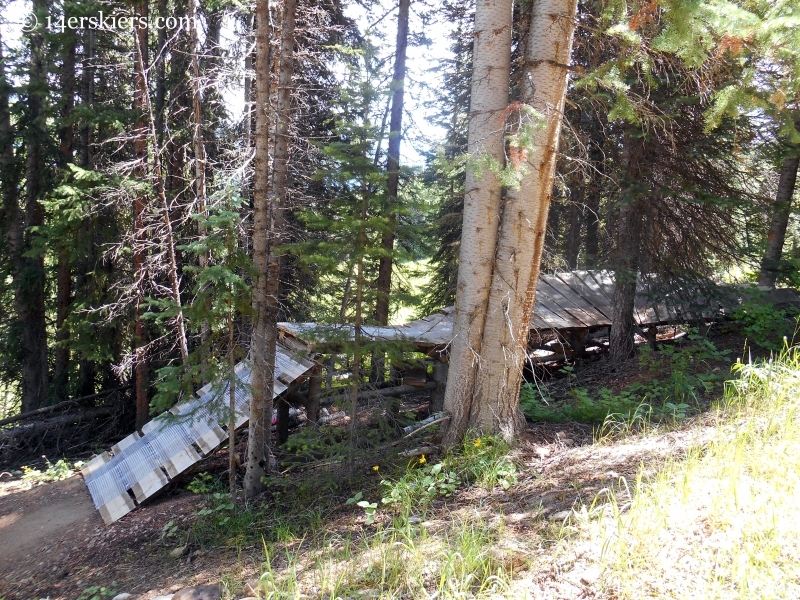 Only about a half mile long, and it connects Prospector to Lower Meander. 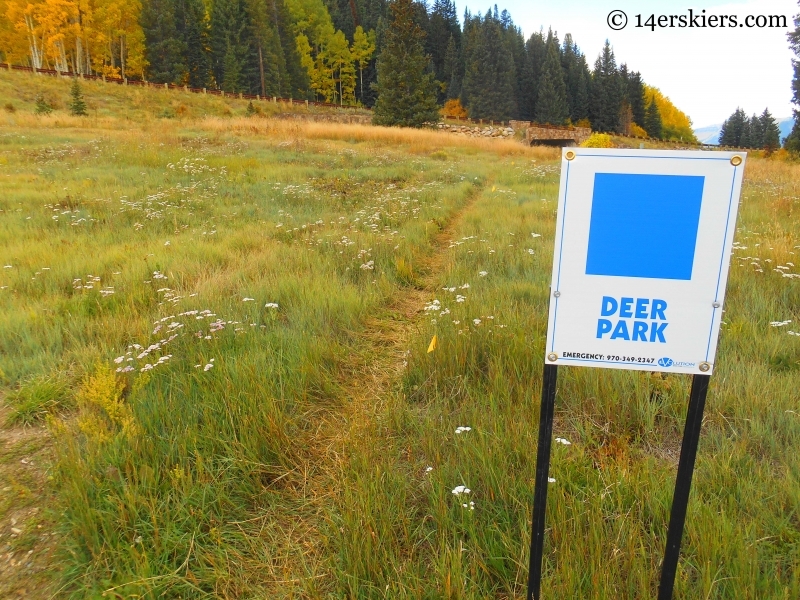 Deer Park is ranked as an intermediate trail, but it could even be a beginner trail. 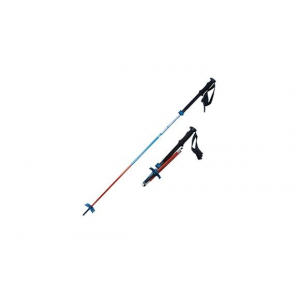 It is a cross-country style trail that is good for both ascending and descending. How you can use this trail: Deer Park makes a nice shortcut if you want to descend Meander, but not all the way. You can then ascend Deer Park until Prospector, and continue upward from there. This can also work in reverse – descend Prospector, but all the way, then use Deer Park to connect to Meander. Or, a short loop can even be made between Lower Meaner, Deer Park, and Prospector, going either clockwise or counterclockwise. 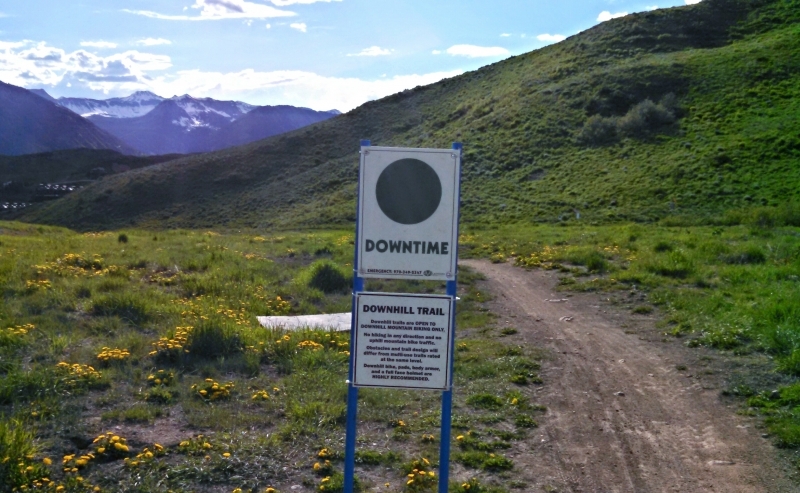 Description: Downtime is a combination of two older trails, along with some new sections to merge them. Because of this, some of the flow of this trail is interrupted when descending.  In a couple of instances, Downtime takes seemingly abrupt turns. These points are exactly where an original trail was altered. 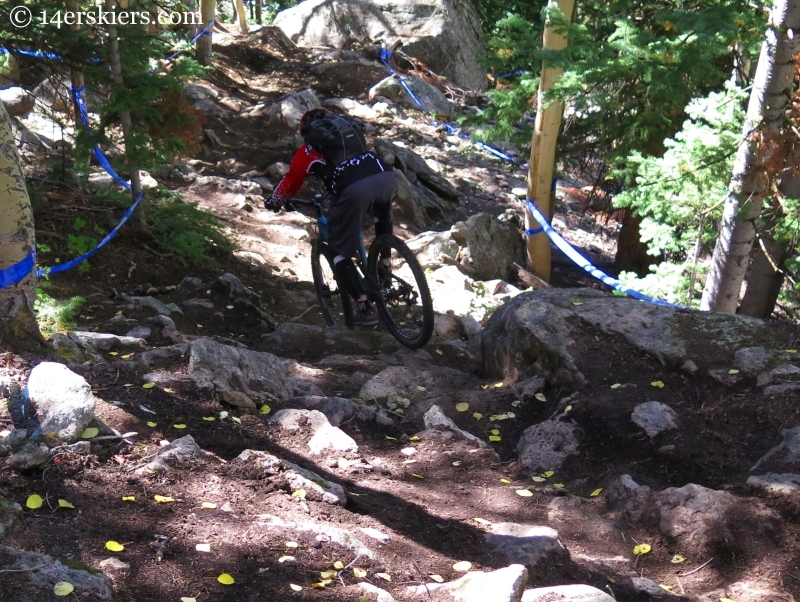 Nevertheless, it’s still a fun and easy trail to use to descend back to the base area. 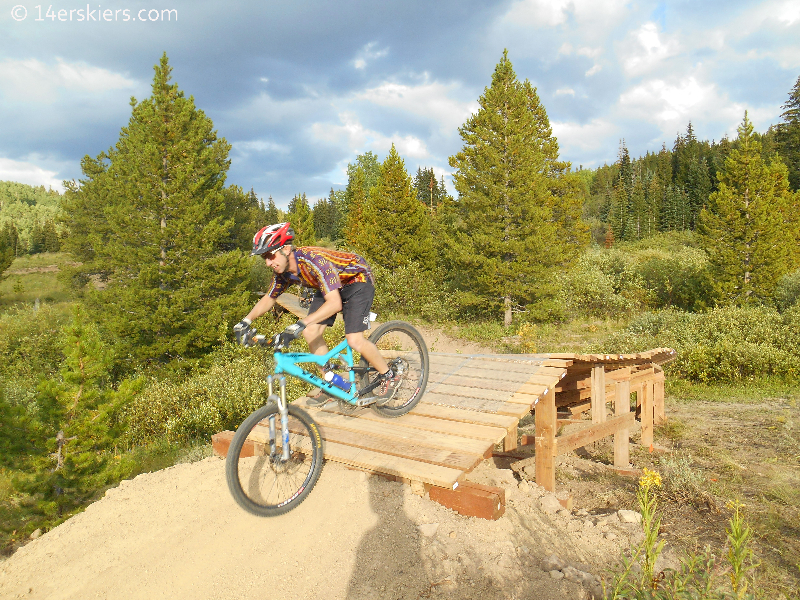 Description: Frequency is a fun trail. But, it’s a “pedaly” downhill – meaning, it requires some significant pedaling along the way to really enjoy. There is one banked left-hand corner that is particularly awesome. Frequency feeds into Luge, where you have the option to descend to the base via Lower Awakening, Downtime, or Lower Avery to the base. 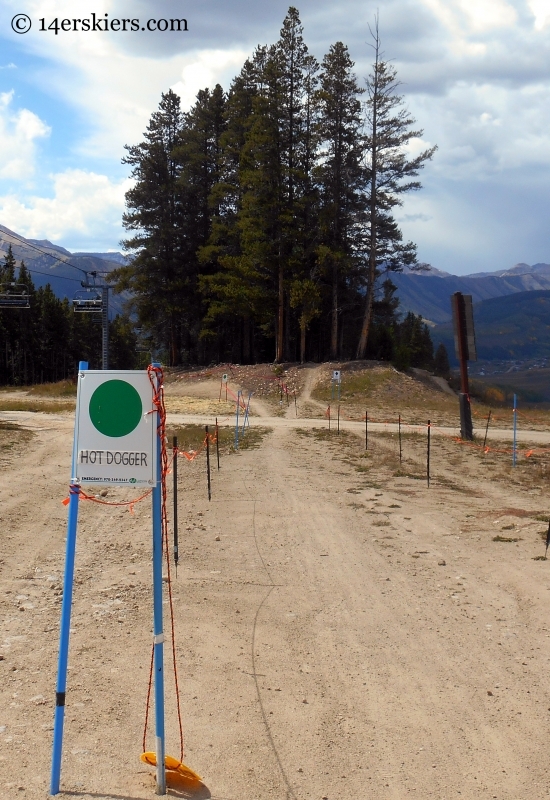 Description: Hot Dogger was added lat in the summer of 2014. 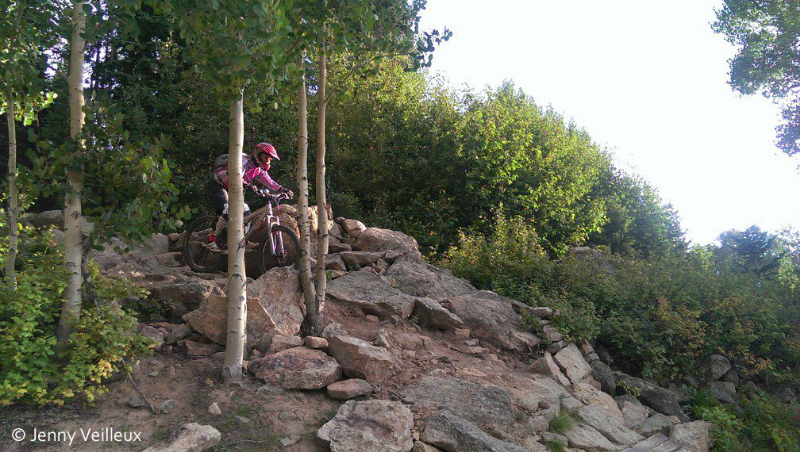 Fun, flowy, and lots of banked corners, this trail is great for riders of all levels. But, it’s a confidence-builder for beginners. 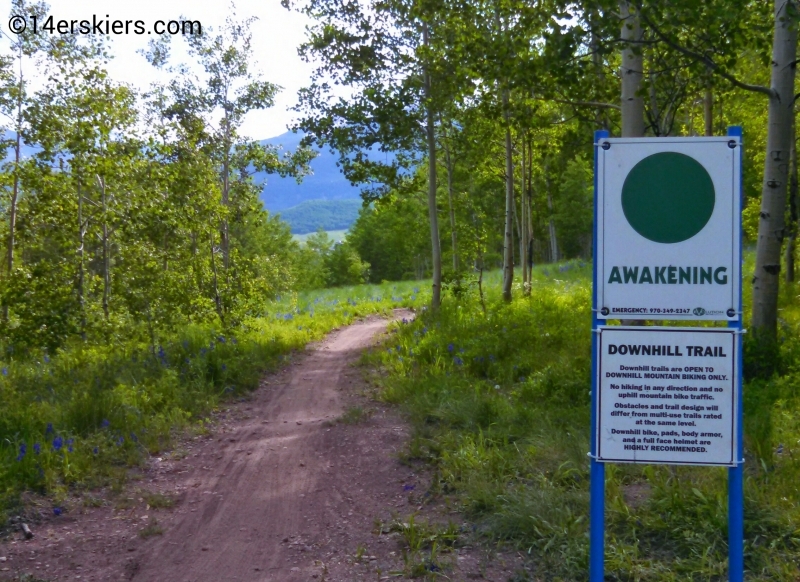 Similar to Awakening, this trail leads right into Downtime, which will take you to the base. 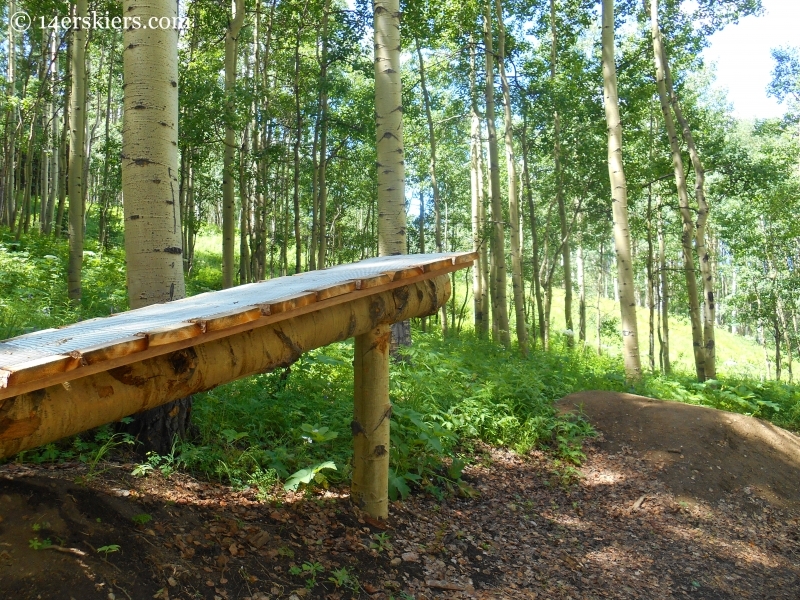 Description: Luge is a trail that has been around for quite a while now, and the trail just keeps on being fun. 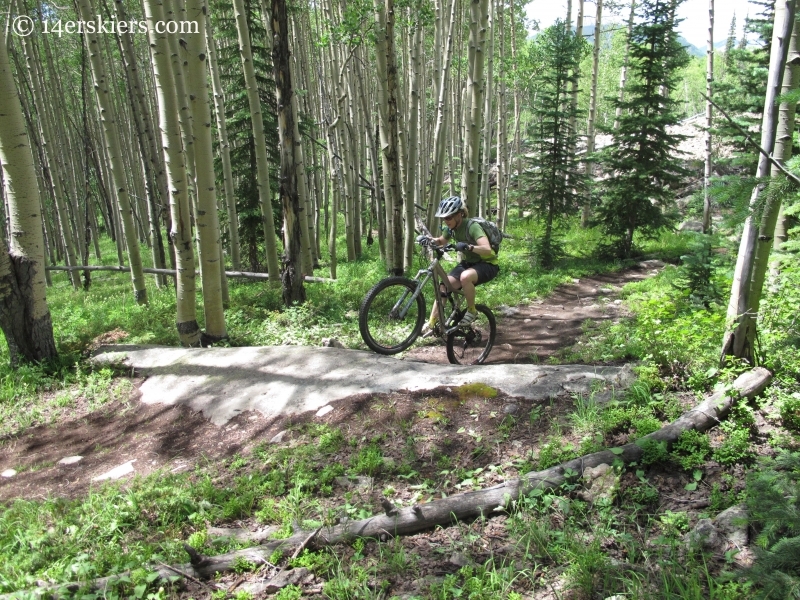 It’s a fun, but not super challenging, downhill trail that descends through aspen forests and meadows. 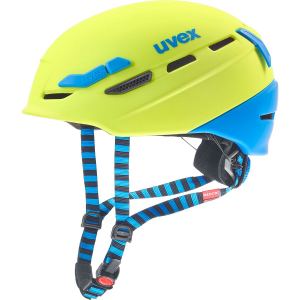 Luge merges with Frequency with options to descend to the base via Lower Awakening, Downtime, Timetable, or Lower Avery. 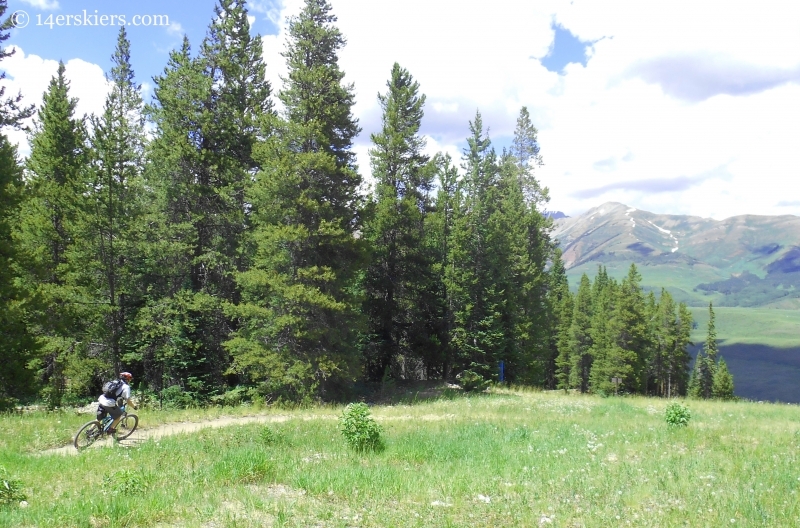 Description: Meander is aptly described as it Meanders through the backside of the ski area. On the descent, there are climbs and on the ascent there are downs. So, it’s very much a “cross-country” style trail. What it lacks for in flow during the ride is easily made up for with the views. 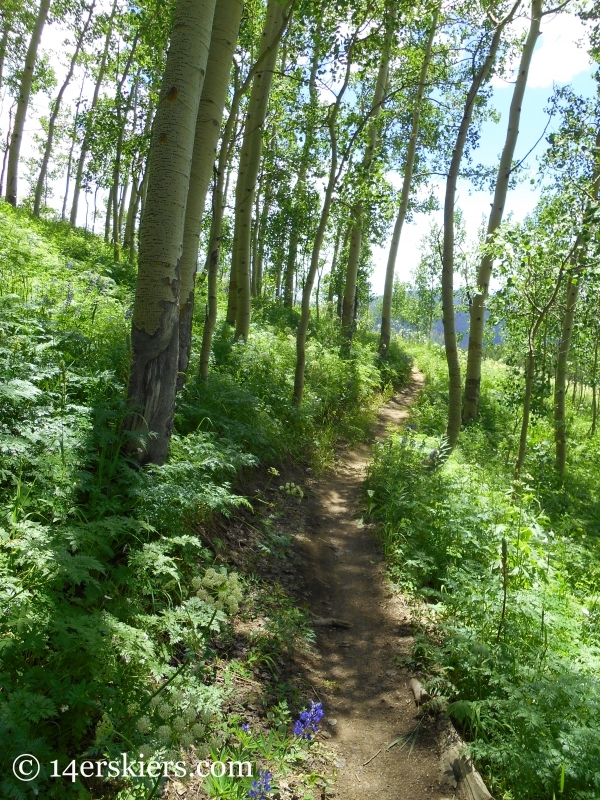 Meander is simply one of the most spectactularly scenic trails we have in Crested Butte. 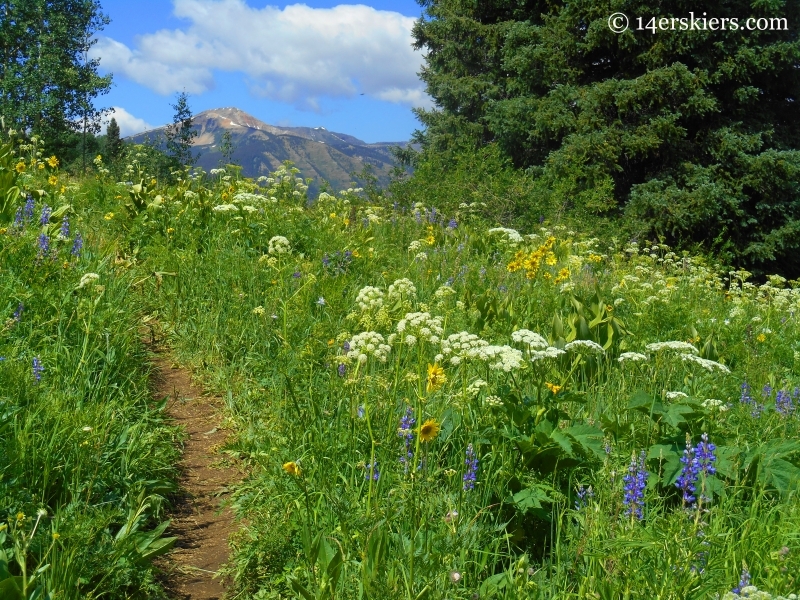 In early summer, wildflowers are abound alongside the trail. 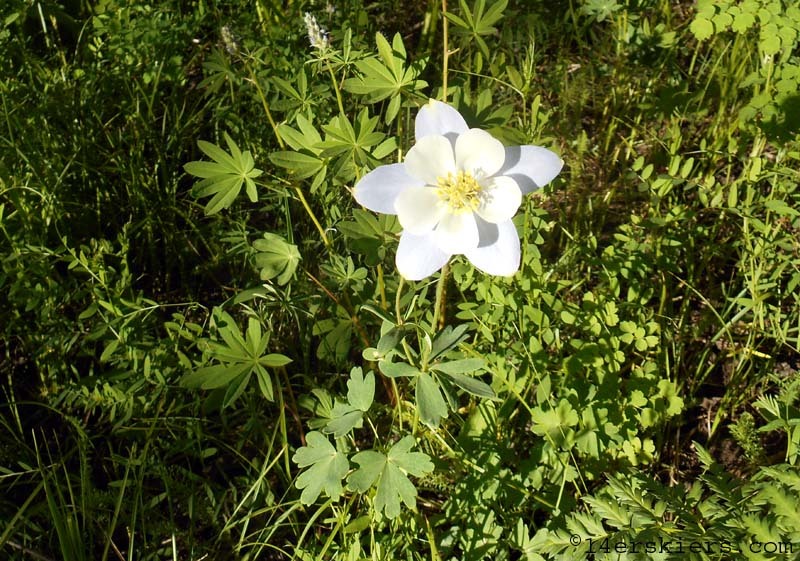 There are far more columbine flowers on Meander than you’ll ever find on the Columbine trail itself. The views of the East River valley cannot be beat. Make sure to bring a camera and plan to stop. You’re going to want some time to soak in the views. Note: If you want to ascend this trail it can be a bit tricky to find. 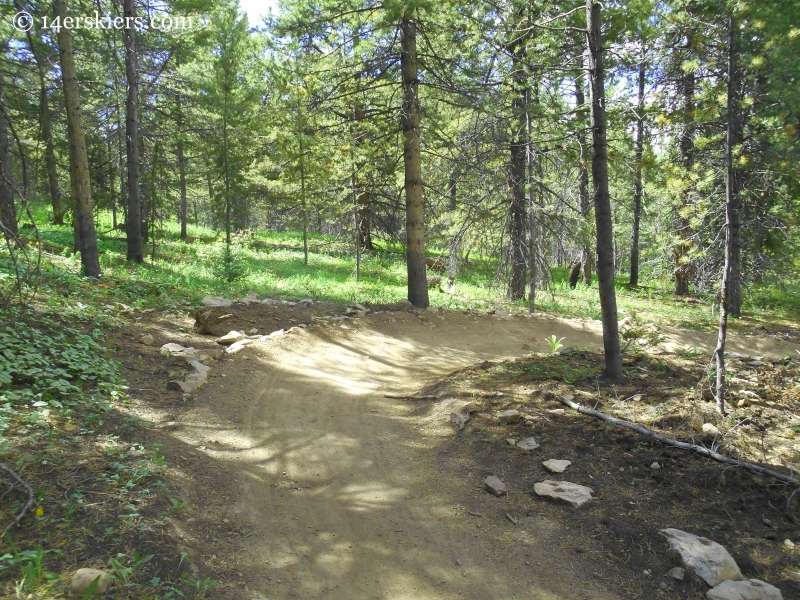 The easiest way to find Meander is to go to the Snodgrass Trailhead (biking there from the base takes about 10 minutes). Instead of taking a left at the trailhead to go up Snodgrass, turn right up a short dirt road. Just a few pedal strokes up the road, there will be a trail that veers off to your left. This is Meander. The entrance for it may not have a sign. 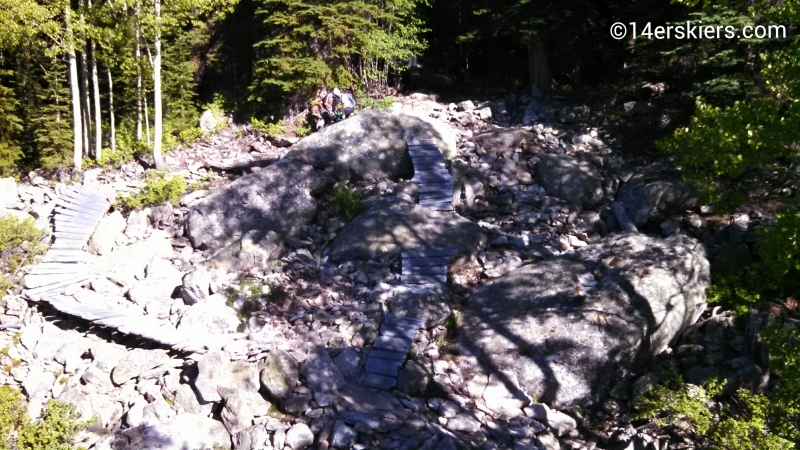 If you ascend this trail, where to go from here: 1) Descend Woods Trail or Crusader. 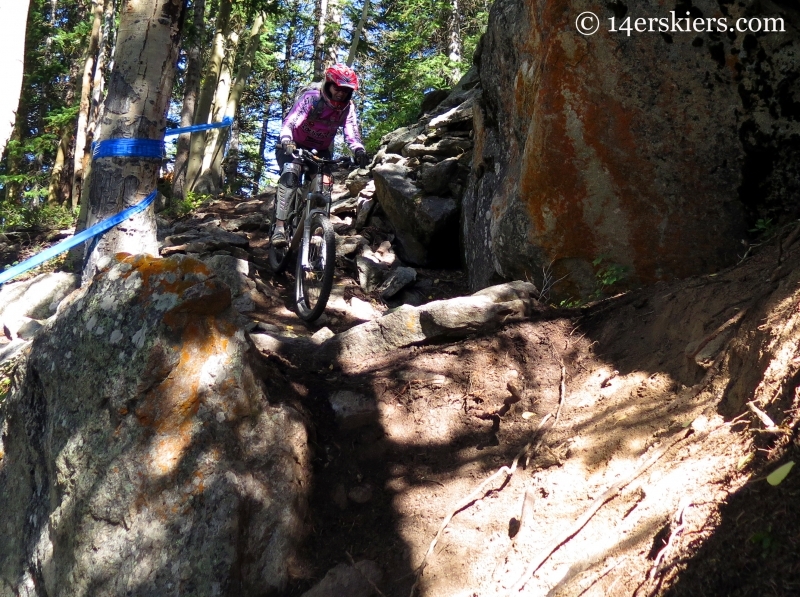 2) Continue upward on Primer to the top of Red Lady lift to access other downhill trails 3) Descend Awakening. 4) Descend Painter Boy (your ascent route). 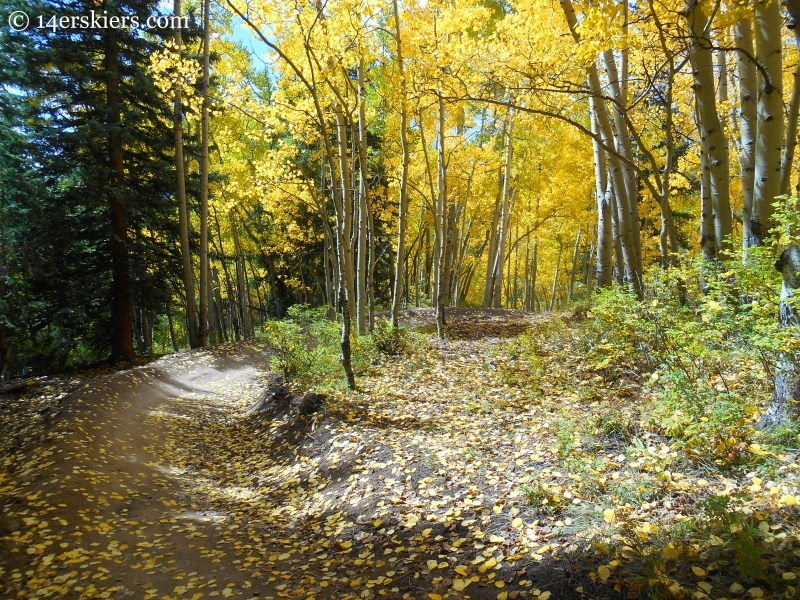 Description: CBMR has done a lot of trail redesigns over recent years, eliminating some trails and repurposing parts of trails to become new trails. But Painter Boy stands as a classic, almost entirely original and unchanged for many years. There’s a reason for this – Painter Boy is awesome. Whether you choose to go up or down, it doesn’t matter. Painter Boy hits the spot. 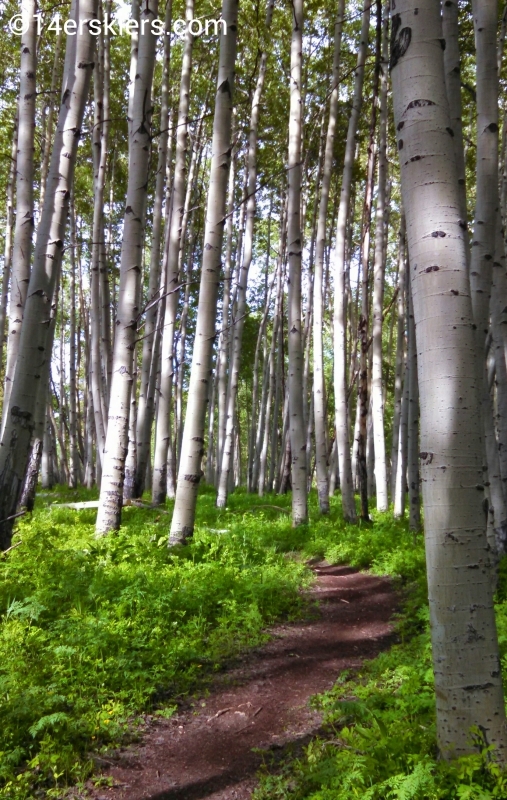 My favorite part of Painter Boy is the upper portion which traverses through a wonderful aspen forest. Description: Primer is a zippy trail that is more or less built to provide access to other trails, mainly to Meander or Painter Boy. 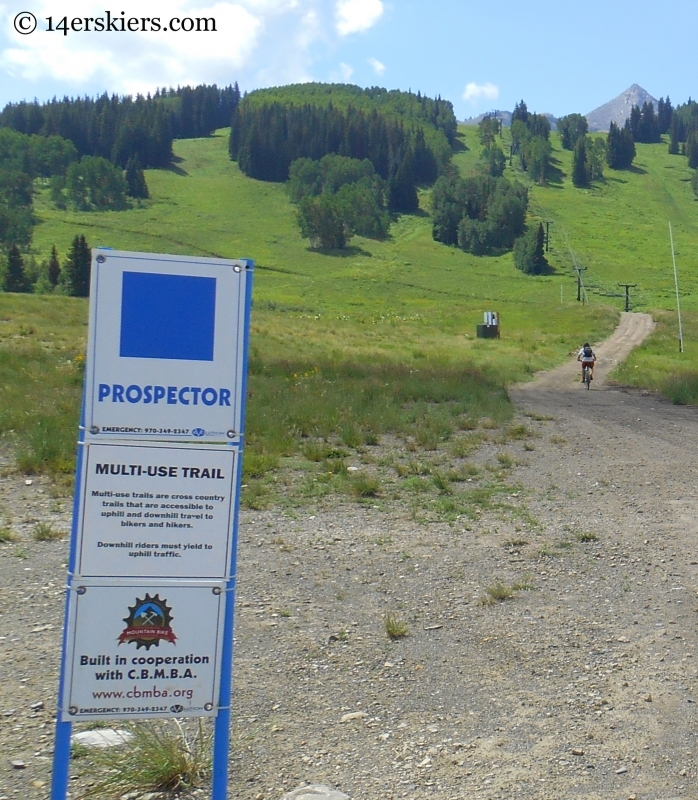 Description: Prospector is another trail that makes a great ascent or descent. 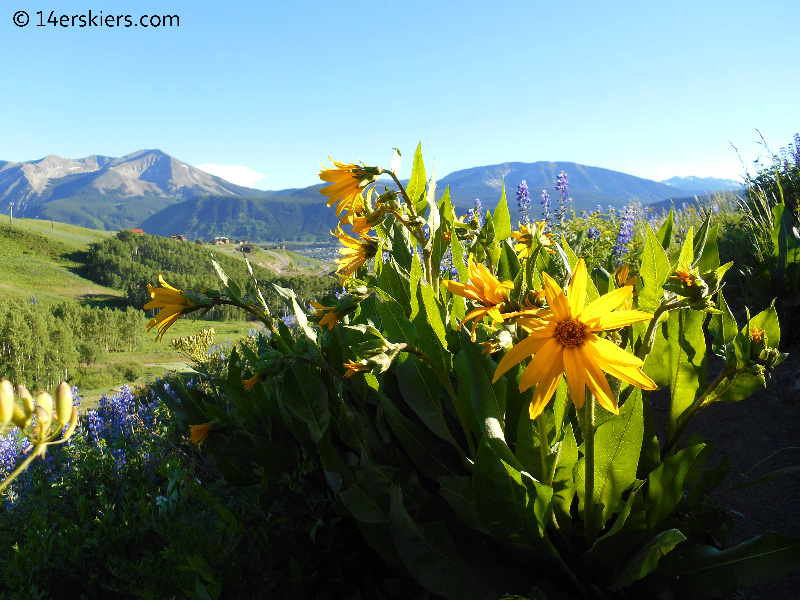 It passes through fields and pine forests, and the wildflowers along the way are usually great in the summer. 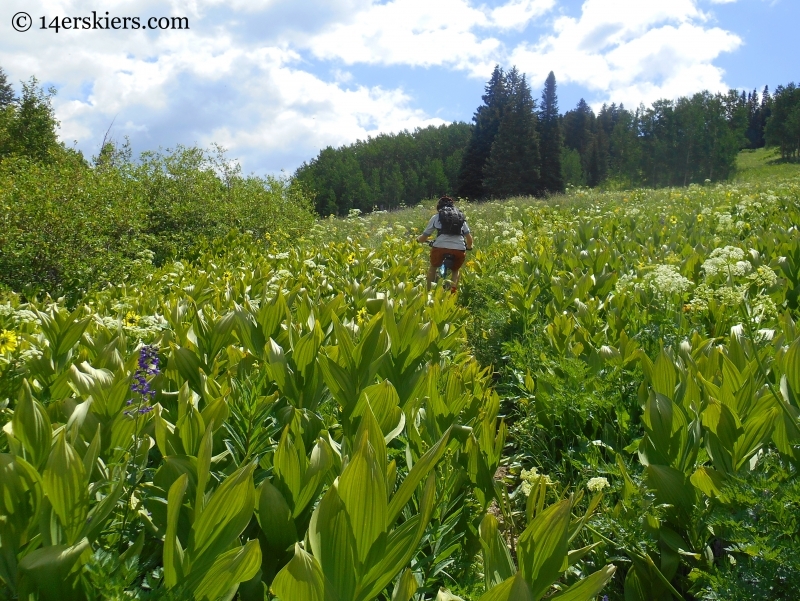 I personally prefer to ride this trial up more than down because I enjoy the wildflowers so much! The trail can be steep to ascend in some places. Description: This trail is for the hardy downhiller. The “psycho” part is shown with the picture at right, as taken from the Red Lady Lift. I have often said how unfortunate it is that the hardest part of this trail descends right beneath the chairlift. But, I supposed that’s great if you know you can rock it through the rocks 🙂 This truly is a no-messing around kind of trail. 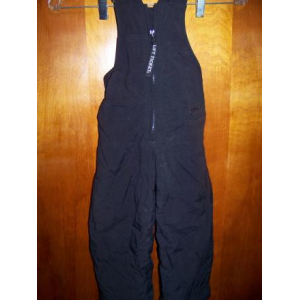 Personally, I descend many of the others in my cross-country riding gear, but not this one. 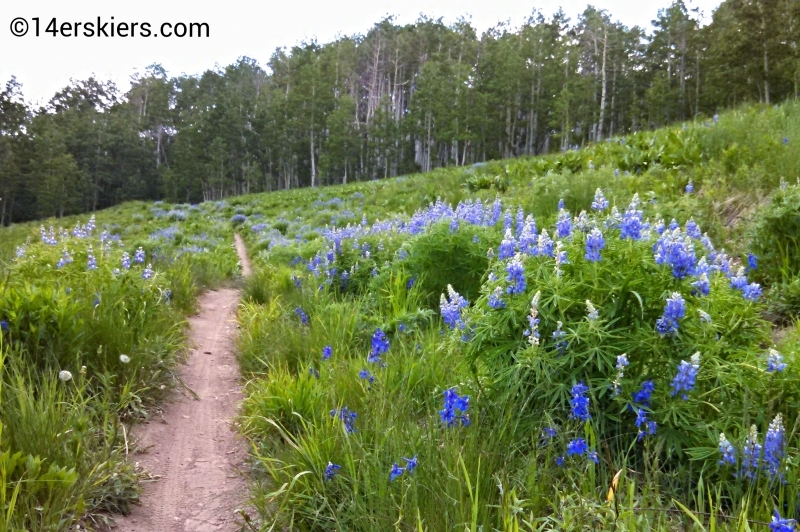 Description: This trail is one of my most favorite ascents at CBMR. 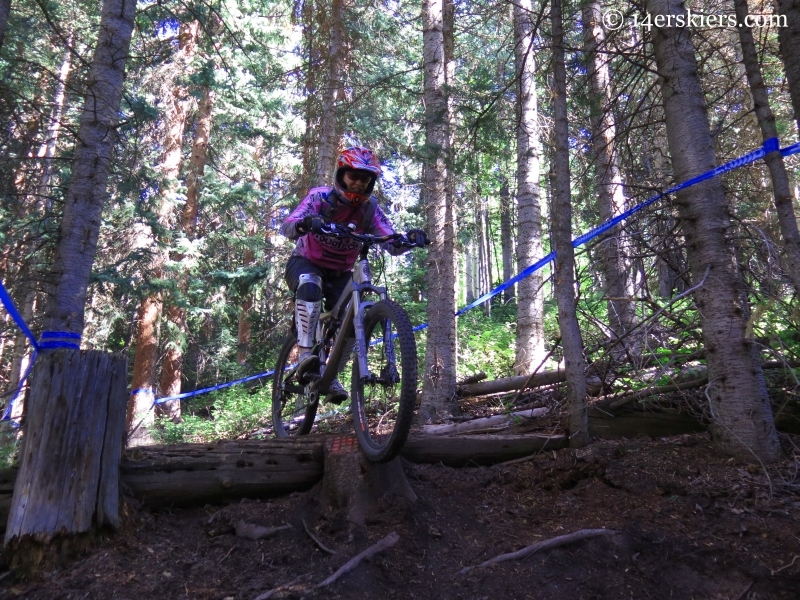 Complete with jumps, banked corners, and build up wooden features, this trail is fun and occasionally fairly steep in places. It’s a great downhill. 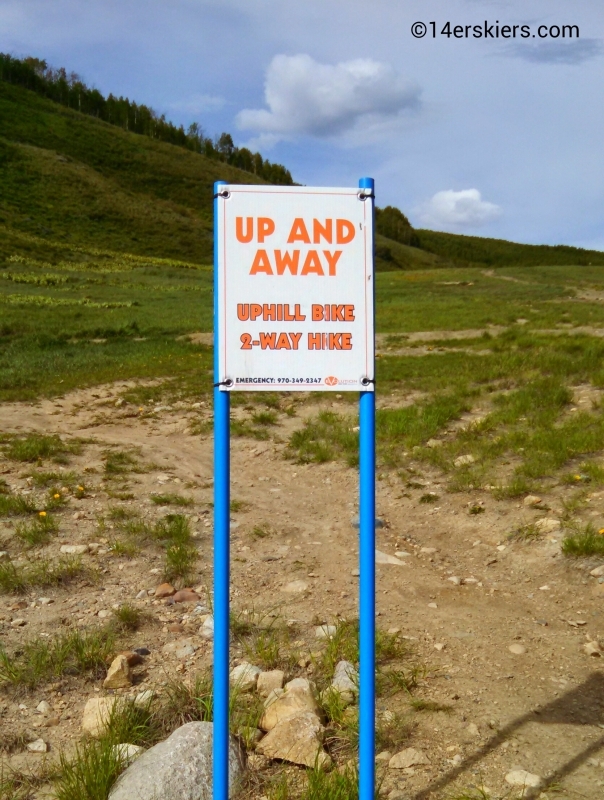 But, this trail is definitely intended for someone who is fairly comfortable with downhilling skills. Link it up with Lower Awakening, Timetable, or Lower Avery to descend to the base. Description: This trail has one of my most favorite wooden features, shown tin the picture at right. However, some of the jumps after this feature may throw you off if you’re not ready, so watch out! Timetable is a great connector trail when finishing Timeline and feeds directly into lower Avery to descend to the base. Description: The purpose of this trail is to provide uphill access out of the base area, which is limited. This used to be a great downhill trail, but was redesigned and repurposed as an uphill only riding trail. 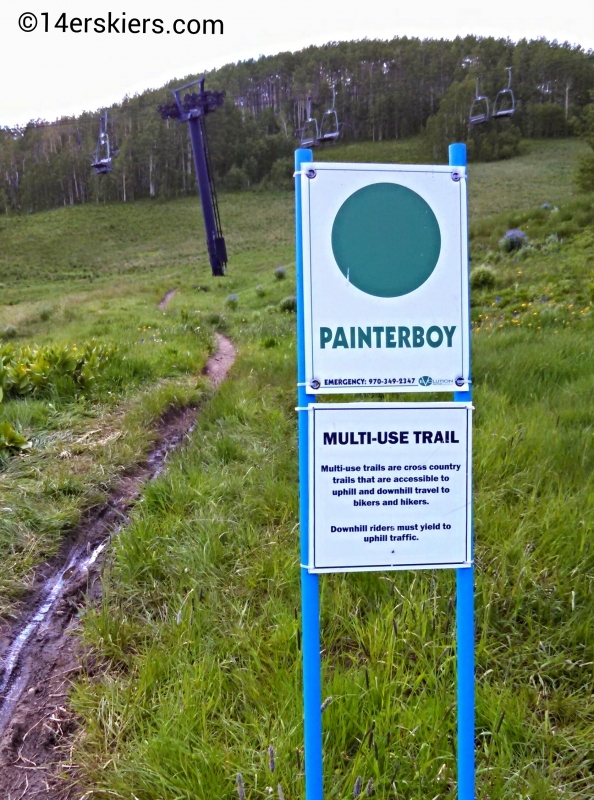 Where to go from here: Diverge off to Columbine part way up the trail, or at the trail’s end you could keep ascending up Painter Boy or descend via Lower Awakening or Timetable. Description: I believe that when Westside was built, CBMR was hoping it would be a great downhill trail. But, it is not. Admittedly, Lower Westside makes for a nice descent. But, the rest of the trail does not flow well. However, Westside makes a great uphill as a whole. Lower Westside is trickier to ascend (as it is actually part of an old downhill trail), but then the trail mellows out a bit after passing the top of the Westwall lift. 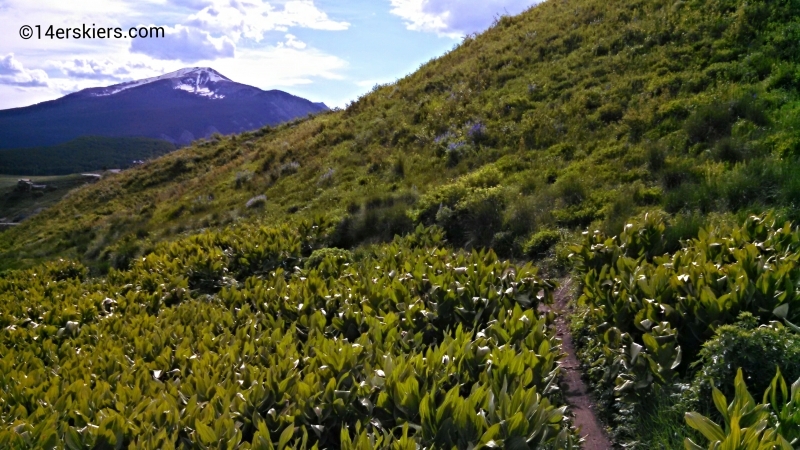 Overall, it is a steeper and more technical ascent than Columbine, Painter Boy, and Up & Away. But, it’s worth it. Westside cuts across some grassy slopes and provides excellent views of the peak as well as the neighboring mountain of Whetstone. Furthermore, the forest it ascends through is magical, especially in the fall. It’s one of my favorite trails to ascend at CBMR. Description: The Wood’s trail, from the start several years ago, was one of my favorite trails to descend on and continues to remain as such. 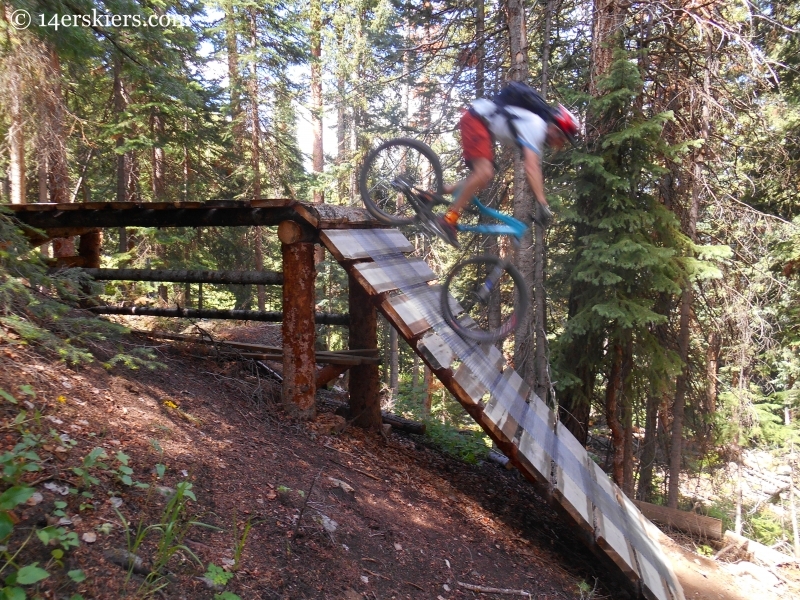 With a couple of drop-offs, tight wooden-features through the trees, some optional banked wooden bridges, and a nice jumpy rhythm section at the bottom, Wood’s trail has enough to entertain riders for quite some time. However, in order to return to the base, riders must descend Propector Road, taking a left onto Gothic Road, riding on the road back to the ski area. If you’re up for riding the resort without using the lifts, you’re likely looking for some loops or combination of loops. Below are some of my favorite loops to ride on the mountain. These are only examples of loops. Many other loops are possible. Also, consider a combination of loops listed above. Make sure to fully check out the links above as well as our biking guide. If you still have questions please feel free to contact us! 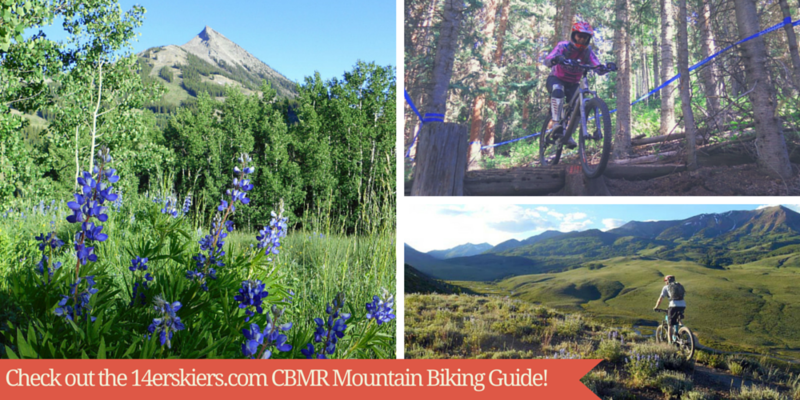 From beginner to expert, CBMR has the trails for you. 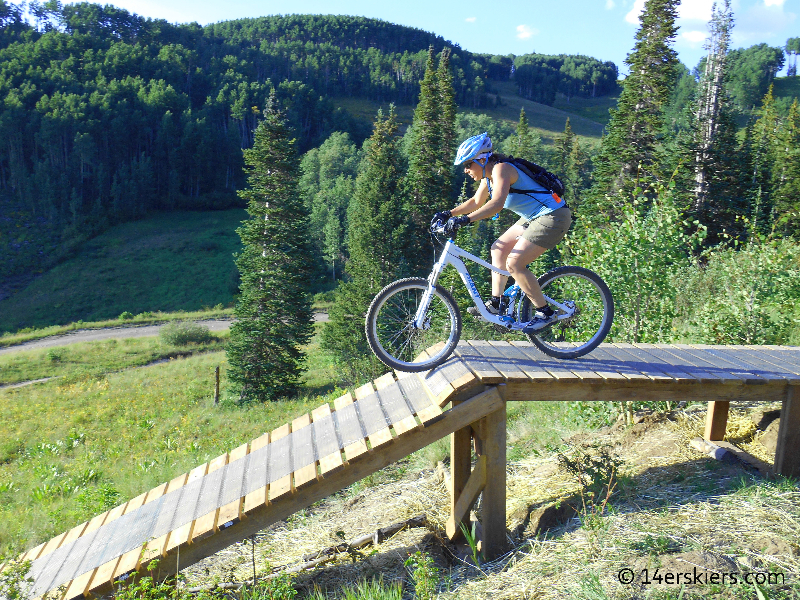 This guide that will tell you what you need to know about biking at Crested Butte Mountain Resort.